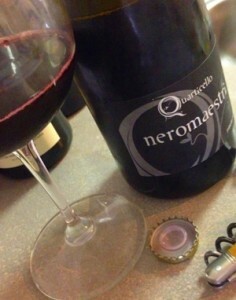 2012 Quarticello “Neromaestri” Lambrusco Emilia I.G.T. Frizzante, Emilia Romagna, Italy. Roberto Maestri’s Quarticello Meromaestri Lambrusco Emilia is a dry and tannic Lambrusco that is made from Lambrusco Maestri 50%, Lambrusco Grasparossa 30%, Malbo Gentile 10%, Ancellotta 10% and it perfect for serious Secco Lambrusco lovers, it has a severe and austere style, meaty/sanguine with a beautiful blue/black hue. This bold Lambrusco is not fruity or sweet at all, in fact it is a bit shocking at first with crisp mineral toned coolness, with intense dark fruits a light mousse and plenty of grip. This has some rustic charm with hints of leather, horse and earth adding some bite and savory vigor, though there is detailed and pretty layers as well with roasted herbs, floral notes, bitter coco, anise and lots of blackberry and cherry fruit, this is a food wine first and for most and it will be seriously good with grilled meats, cold cuts, cheeses and I loved it with a mound of pasta. With air and cuisine this sparkling red turns on the class and shows why Roberto Maestri is the talent he is, this gains delicacy and everything becomes heightened and focused, while dusty dry in style it really is a fantastic wine. Look for black fig, plum and cedar to linger here and I highly recommend taking a look at the Quarticello line from Roberto Maestri, especially this darkly fantasyic Neromaestri, drink this anytime, and over the next year or so, another stunning effort.